On election night, Jason Sonenshein merely hoped an anti-traffic camera ballot initiative for which he had campaigned would squeak out a win. He was nervous. In the days leading up to the election, traffic-camera proponents had increased their advertising, including a TV spot featuring an emotional appeal to voters from a popular former Cleveland mayor, whose nine-year-old daughter was killed by a red-light runner. "I was really kind of worried," Sonenshein said. "Based on the performance of other anti-camera initiatives, I thought we'd win, but there was also a chance we'd lose. Whatever the outcome was going to be, it was going to be close." It was a landslide. Cleveland voters rejected automated traffic enforcement by more than a 3-to-1 margin, with 77.5 percent of the ballots against keeping the cameras. Issue 35, the anti-traffic camera measure, carried every one of Cleveland's 332 precincts. Not to be outdone, voters in the nearby suburb of Maple Heights, Ohio, rejected traffic cameras in their own ballot initiative with 76.6 percent of the vote. The measure there, Issue 99, carried all 19 precincts in the town. They weren't alone. In other parts of the country, results from two other referendums on automated traffic enforcement swung hard against keeping camera programs. Voters in Sierra Vista, Arizona and St. Charles County, Missouri rejected the cameras by more than 70 percent. In Sierra Vista, the local newspaper surveyed voters at six local polling places and noted that across the city, "red-light cameras seemed to be the only thing that polled lower than President Obama." State lawmakers in both New Jersey and Ohio are considering legislation that would restrict and prohibit, respectively, the use of cameras in traffic enforcement. "It shows a clear mandate from voters for getting rid of these traffic-revenue cameras," Sonenshein said. "Traffic safety concerns me, but I think there are ways to improve traffic safety without the due-process problems presented by traffic cameras and the potential for false convictions. Why not try those first?" Recent election results sharpen the focus on a clear trend of automated traffic cameras falling out of favor with municipalities that use them and the motorists ticketed by them. The number of traffic-camera programs, particularly red-light camera programs, is on the decline across the country. Seven red-light camera programs were dropped over the past month, bringing the total to 495, according to records kept by the Insurance Institute for Highway Safety. That's down from a total of 540 two years ago. Speed-camera program numbers have trended upward over the same time period, though they, too, may have peaked. Over the last month, they have fallen by two programs to 138 total. The numbers don't include the end of a New Jersey red-light camera pilot program, which is set to expire next month. On Sunday, a group of approximately 70 to 100 protesters on Long Island gathered urging officials in their county to follow New Jersey's lead. 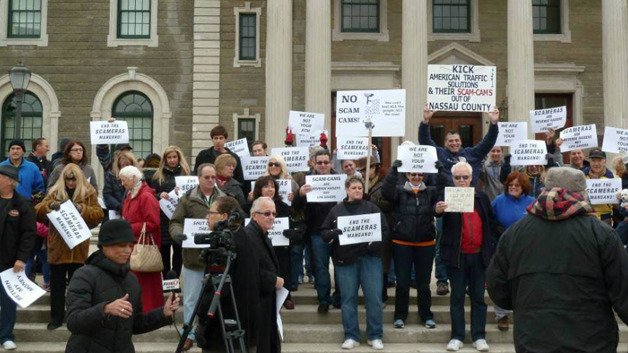 They picketed in front of a county administration building in Mineola, NY, asking Nassau County to refund tickets doled out since a speed-camera program started earlier this year. "It took us by surprise when it started, when you're not a party to a conversation," said Gavin Cummings, an anti-traffic camera advocate who helped organize Sunday's rally. "We think the program has been poorly implemented and completely mismanaged. We'd like to see tickets issued to date refunded, then the program indefinitely suspended until a meaningful solution is worked out." Both Sonenshein and Cummings echo the concerns shared across the country. Sonenshein says motorists are often denied their due-process, which he says is alarming with some cameras that have rates of error in excess of 10 percent. Cummings notes companies that make and manage traffic-camera equipment earn high percentages of the revenue generated, which creates an incentive for them to generate more tickets. American Traffic Solutions, the vendor in Nassau County, earns 38 percent of all revenues collected. A Long Island television station says the cameras are generating about $200,000 per day in revenue for the county. "Our primary objection is that the stated purpose of the speed-camera program in our county is to improve school safety within school zones, and it's clear that's really not the objective," he said. "If you really want drivers to slow down, how about flashing lights? Or more lights? Instead, they hide cameras behind overgrown tree branches and send a ticket in the mail a month later. How does that protect children?" Studies have shown the safety benefits of traffic cameras to be mixed – they may change driver habits over long periods of time, and they may decrease the number of T-bone accidents even as they increase the number of rear-end fender-benders. But even ardent safety advocates say traffic cameras shouldn't be viewed as revenue generators; they should be implemented in a way that makes them easy to spot for motorists. "It's a tough issue, because we do believe it can save lives," says Michael Greene, a spokesperson with AAA, the nation's largest motoring club. "When it's done right, lives are saved. When it's not, people feel very angry about it." He cites a recent controversy in Chicago, in which the Chicago Tribune revealed the city had lowered the yellow-light times from 3 seconds to 2.9 seconds. It doesn't sound like much, but the tenth-of-a-second difference netted the city a $7.7 million increase in red-light camera revenue. That came on the heels of unexplained spikes in the number of tickets produced at certain locations, as well as the indictment of Karen Finley, the ex-CEO of RedFlex, the traffic-camera vendor which served Chicago, who stands accused of bribing city officials to steer contracts in the company's direction. On Long Island, Cummings says his group has sought more information from Nassau County regarding its program through Freedom of Information Act requests, but those requests have been denied. Newsday, the major newspaper on Long Island, also notes the county has stopped providing information on the camera locations. The lack of information has left residents feeling the program isn't being run in a transparent way. "We want to sit down and work out a solution," Cummings said. "But we're getting total silence from legislators and elected officials. It feels like they're not interested in a meaningful solution to a real financial problem for cash-strapped residents."